Given all the current news that is so directly connected to the history of it, I am surprised nobody has noted that today is the anniversary of the 'ceremonial' beginning of the Lower Hill District's demolition on May 31, 1956. The semantics of both 'ceremonial' and 'beginning' are a bit loose as not everyone was celebrating and the actual demolition had been underway more than a month. 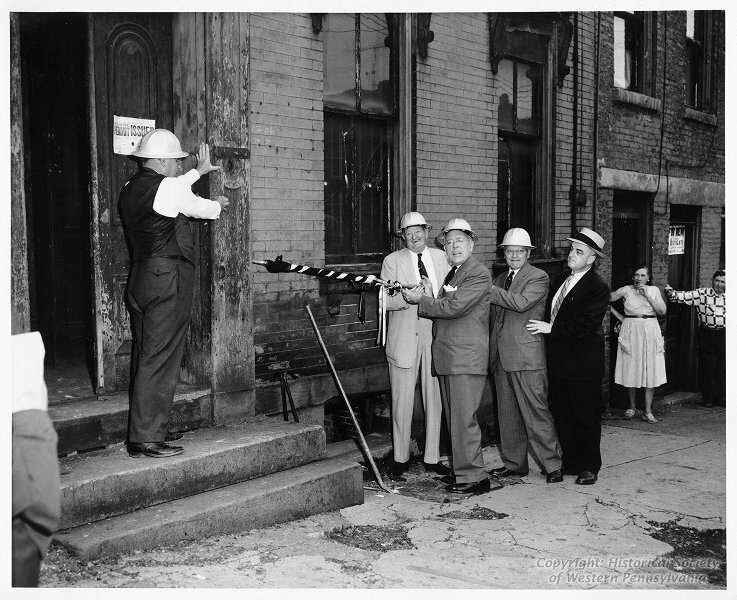 But I have two comments on the picture that encapsulates that day.. 1) What is that tool Mayor Lawrence is wielding? and 2) What is the expression by the two bystanders on the right? They don't appear to be there with the official entourage? What really is remarkable how the ripples, if 'ripples' is a misplaced euphemism in itself, of all this continues to so many of the front page stories today in Pittsburgh. All that is going on with regards to the proposed Hill District developments has been catalyzed by the history of the Civic Arena. Then there is the ever degenerating miasma that is the financial state of the August Wilson Center, whose entire body of work is tied to the geography imploded, to so much else that defines the state of the city of Pittsburgh today. Nobody has really written the final history of what happened to the population displaced from the Lower Hill as they moved elsewhere in the region, many of whom were displaced sequentially into the future. Hacking is a maligned term these days. Like everything else, there is hacking for ill and hacking for good. Let's focus on the good. I hope all know (ok, maybe I hope at least a few know) that today is National Day of Civic Hacking. OpenPittsburgh has goings-on in Homewood today in support. All good. Apologies for a bit of retrospection, but civic hacking is a polite phrase for a little of what goes on here. Not that long ago the only way to figure out what was going on with property assessments in Allegheny County was my own personal little data war (with a lot of web scraping) first documented in this old post: Anger, Angst, Assessment. Better work was the follow up by some, especially that of Tom Moertel focused on Mount Lebanon and reported in a series of posts on BlogLebo, There really has been remarkably little follow up in the record on the 'impact' of the now historical assessment on the future of Allegheny County. In the end it all may only be remembered via the higher art of satire. (Speaking of 'transparency'.... Why is there no video of Off the Record XII out there??) So it goes. Long before that I sometimes practiced scraping of campaign finance data to make visualizations like this on what state legislators had the biggest cash balances some years ago. And really less 'hack' than just an attempt at introducing some sheer transparency locally, I have been lax at keep up to date all the parts of my Pittsburgh Pension Page. Still, I'd be happy with any comparison to all of the data available on the official city of Pittsburgh pension page. Yes, more than enough navel gazing there. Sorry. Others have long since jumped way ahead of those rudimentary little obsessions. Some Pittsburgh civic data is available these days that never was before. But still infinites amount to do out there in Pittsburgh. What is next big civic hacking challenge in Pittsburgh? Could be almost anything. If you are interested at all check out the Code for America Pittsburgh Brigade (aka OpenPittsburgh) via their Google Group. Seriously, what data should already be out there?? Personally I really have to wonder all that might open up if the Pittsburgh Parking Authority could ever make electronically available any of the data collected and locked up in all of the new electronic parking meters? Think about that. That and the Parking Authority recently mentioned in passing that it has an phone app in development, something which would let Pittsburgh catch up with the city of Latrobe already has. I really wonder if the web app in development here (so says the previous link) is for real at all or just an easy answer to a reporter. Has anyone seen an RFP or contract of any kind? It also goes without saying that the it's-going-to-come-eventually real time transit data from the Port Authority was not years in the future still. Godot at the bus stop?? The good... yet another month that Pittsburgh's unemployment rate stayed well below the national average. A hundred jobs here, a hundred there, it adds up... and may explain a bit why any net gain is elusive no matter what other expansions or ribbon cuttings there may be out there. Also a bit disappointing is a sidebar that some new Alcoa manufacturing jobs are decidedly not here. The big thing for me in this is, the jobs were not lost to a location in the South or West, but to Indiana and right in the middle of all that was once the rust belt. See: Alcoa to build $100M plant in LaPorte. But note also the line in the article where it says the "plant is part of Alcoa Inc.’s strategy to downplay its roots as a mining and aluminum-smelting company." Something not so much noticed here, but Alcoa is moving on in a sense. But just keep in mind something we all do a lot, which is to conflate Pittsburgh, the city proper, with Pittsburgh, the region as variously defined. But on this topic of immigrants this really matters. The low rate of international immigration that is often mentioned (here and elsewhere) is very much a regional metric. I at least have not spent much time benchmarking cities, although most assume the pattern is the same as for the region which is not a jump you always want to make. When it comes to international immigration, the city of Pittsburgh proper has some different stats. Here is the data I see for the impact of the foreign born population arriving relatively recently (since 2000) among counties within the Pittsburgh MSA, along with similar metric for the city of Pittsburgh and with Allegheny County divided into city and non-city portions. So the pattern of immigrants living in the city is actually not that different from a national average. Still lower than a lot of other comparable major cities mind you, but what is really different about Pittsburgh is just how low the recent immigrant numbers are once you get outside of the city proper... and then into some extremely low numbers once you leave Allegheny County. That is a lot less talked about in general, but the contrast with the city is pretty stark. Looks like a lot of reflections (and data and analysis) of Pittsburgh covered in the book. I'll be lazy and just play off a front page story in the PG today on the re-opening of Mellon Square in Downtown Pittsburgh. PG: Coming out party for Mellon Square. Some may ask what the big deal is? The story touches upon the greater appreciation for the small-ish park in the past, but back in the day virtually anything green in Downtown Pittsburgh was probably something to take note of. Point State Park might come to mind, but it would not be open for decades (August 1974 to be precise) after Mellon Square first came into being. So to pull from the archives here... this 1963 cartoon gives you a feel for how big a deal Mellon Square Park once was. Of course to me the cartoon has a lot of other symbolism for changing Downtown, and a changing Pittsburgh. Gulf? Gone! Alcoa? Moved across the river. The Penn-Sheraton? The Mellon-US Steel building..... But still Koppers has remained in both corporate structure and location. That is getting pretty rare in Pittsburgh business history. More on the source of that graphic. I was wondering if the city ever completed its inventory of its war memorials. It turns out it did. See the City of Pittsburgh Preliminary War Monument Inventory, ver 1.0. Should give everyone plenty of choices for places to visit tomorrow. Maybe it exists and I can't find it, but this really needs a interactive map. But check out page 52 (per the PDF numbering) of a missing monument once located in Four Mile Run, a section of Greenfield. A mystery? Would anyone have really disposed of it? I am impressed at the detail of the list, but I suspect there are a few memorials yet to be included. So just some to add for ver. 2.0. For example I don't see any listings for what I think are several memorials within Allegheny Cemetery, where the Lawrenceville Memorial Day Parade ends tomorrow. See you there. What is a bit humbling is this picture is almost 7 years old now. 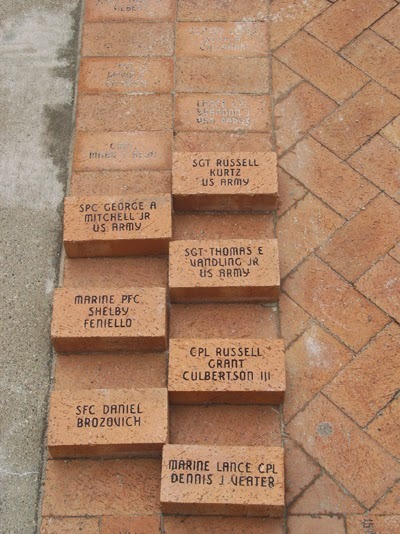 Many more new bricks have followed on the promenade of Soldiers and Sailors Hall. So here is something to think about for sure. The SSTI has released data on the expenditures by state governments on Research and Development (R&D). Pennsylvania for sure has one of the higher absolute levels of spending on R&D among states: $71 million in 2011. But it also has had one of the largest declines in R&D spending over the previous 5 years of data they have compiled., the comparable number was over $117 million in 2007. Only Michigan had a larger absolute decrease in its support for R&D. So good or bad? For Pennsylvania, still high, but dropping? And how high is high? $71 million is on par with the salary of just one professional sports team (with one notable exception we can all think of...). I believe every NFL team spends $100 million on salaries alone, some may double that $71 million statewide number. The thing about whether Pennsylvania's spending is high or low has to he considered in context to the story we like to tell. Pennsylvania once came up with things like the Ben Franklin initiatives to jump start Technology Based Economic Development (TBED)* at the state level across the nation... and all of that. Did we back that story, or do we continue to back that story, with concomitant funding levels to make it meaningful? A subject I do have a forthcoming book chapter on, for those who are interested. There was an election earlier in the week right? Seems strange. Also, I know a lot of attention has been paid to two contested Democratic primaries for state house seats in Allegheny County. But I really think the most interesting results were in another, nominally uncontested, Republican state house race in the region. In Pennsylvania's 12 legislative district, covering parts of southern Butler County, incumbent Daryl Metcalfe had an incredibly tight race against... nobody. The only other announced candidate for the race had long since been tossed off the ballot for failing to file some required paperwork. So who was his race against? 'Write in' wound up with 45.5% of the vote across the district, which seems like an incredibly high result against a long term incumbent, let alone an incumbent who felt secure enough to run for Lieutenant Governor just a few years ago. Has a write in candidate ever beaten an incumbent in a Pennsylvania primary for a state house election? In a primary? I imagine it has happened, but still must be incredibly rare.So here is the map of how the write in votes came in across the district. Write in actually won in 5 4 of the 22 precincts that make up the district. In almost all precincts (with one exception) "Write in" received at least 40% of the vote. Someone might have wanted to stay on the ballot. A number folks out there (I'm projecting of course) are waiting for the latest (2013) population estimate for the City of Pittsburgh. That will come with the release of subcounty population estimates from the Census gnomes on Thursday. The city's population has been moving target of late. Go back two years and the estimate of the city's population in 2011 showed a jump of a whopping 1,780 people over 2010, an increase that marked the first population increase for the city of Pittsburgh in at least 60 years if not longer. You may note my caution with that data in the only coverage that year. There was a reason, actually several reasons, I doubted that estimate would hold up into the future. Skip ahead a year and the estimate for 2012 showed another increase, but a paltry 152 folks, but the big jump the year before was mostly revised away. That +1,780 jump between 2010 and 2011 was revised downward to a jump of +542. So still an increase, but far from what was reported a year earlier and still a number with both data and methodological questions that make it hard to conclude there really was an increase. Still, error or not, any increase is better than the decrease that has been the norm since forever for the city. The last decade the city showed population gains? Between 1930 and 1940, but that has been estimated to be the result of a few marginal annexations to the city proper, not any population growth per se. So we wait for 2013's population estimate and any possible revisions of previous data. Will population in the city decrease or increase, and if so by more or less than the net gain of 152 in the most recent year? Here is the problem. Population change comes from only two trends: natural population change (births minus deaths) and net migration. Lets just look at the first trend there.. births. Here is the trend in annual births to city of Pittsburgh residents from 1990 to the most recent data in 2012. What jumps out is that for the latest (2012) data on number of births among city of Pittsburgh residents is the lowest it has ever been. A bump up 6 years prior does not appear to have been the start of any trend. That may be a story unto itself, but hold that thought. So even though the population estimates showed an increase it wasn't because of any trend up in local births, in fact the drop in births between 2011 and 2012 was pretty steep percentage wise. How many fewer kids are there in the city? The number of births in 2012 was 3,340. In 1960 the city's population of those less than one year of age was 12,011, suggesting the number of births the year prior. But natural population change is births minus deaths. Here is the same birth data matched with annual deaths in the city of Pittsburgh. So the number of local deaths is itself dropping even faster than the number of births. The local funeral home biz must not be what it once was even just a few years ago. Also probably a story in that as well. But births have exceeded deaths in the city for 6 years at least. The net difference between births and deaths for the city was positive between 2011 and 2012 by 400. So if you believe the +152 population gain,, net migration would still have to be negative for the city proper. But the 152 number is way more precise than you want to hang your hat on. Still, there is broad conclusion that if the city's population has stabilized at the very least, the main reason is that we have reached a point of demographic exhaustion... basically the rate of city residents dying off has slowed. So even with the historically low number of births, the continuing drop in the number of deaths has pushed natural population gain positive for the city proper (though it remains negative for the region) and is enough to offset even minor migration losses, not that we really have hard data for net migration at the municipal level. I meant to post this yesterday. But ICYMI, the city of Pittsburgh presented a proclamation to the local Coast Guard commander on Friday. I'll take the opportunity to mention he who might be the most famous local Coast Guard veteran, one Arnold Palmer (aka Yeoman 3d Class Palmer). 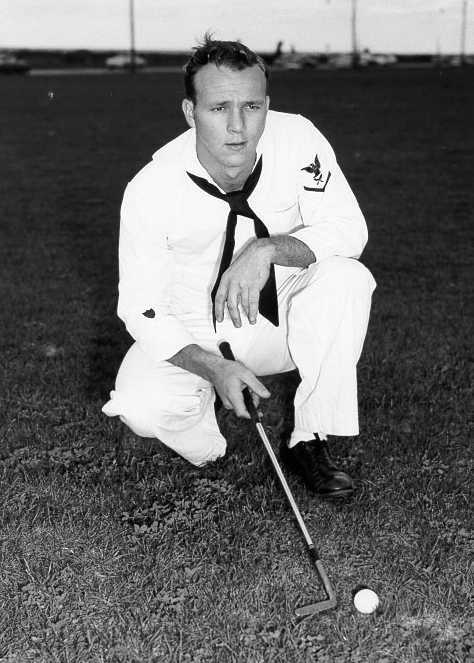 Even in uniform, always a golfer. Uniform regs at the time were probably a bit vague on whether one has to wear a cover while playing golf? Lots of news mentioning the 60th anniversary today of the Supreme Court decision on Brown v. Board of Education. Long time ago, but realize that it was more than a quarter century until the Woodland Hills School District was formed by a Brown-inspired and Federal court mandated consent decree to address segregation issues here. And if that seems like old news in itself, the one school district that did not get rolled into the geography that formed Woodland Hills is the semi-extant Duquesne School District. Why the ongoing failure of the Duquesne school district, which failed at finding any local school district willing to take its elementary students with the state of Pennsylvania paying the bills, is not in the news befuddles me. Remember that the elimination of Duquesne's High School was, at least nominally based on segregation issues. But what was needed for high school students is apparently not needed for younger students? Anyway, I raise you a decade and show you the 70 year history of residential segregation by race in Allegheny County. It's like city finance day in the PG.... Did anyone notice that the Pittsburgh ICA chairperson (can you name him/her without checking the link?) had an oped in the PG today: Redefine ‘oversight’ for the city of Pittsburgh. Note the new domain-less web site for the ICA seems to be keeping up on its 'news', so someone is at the helm there, or at least paying the PR contract. But the site still seems to have excised virtually all of its not-cheap research it once commissioned. Still a curious site that must have its DNS still set up incorrectly? Speaking of the core of city finances.. I am unclear if this make ink, but also in the PG: In The Lead: Working / In Pennsylvania, a wage tax heritage. I note in passing the item that a new development is coming to East Liberty, actually an extension of some past development. This new effort is labeled East Side III. PBT: Mosites unveils plans for next phase of East Side project. Worth mentioning because the redevelopment of East Liberty is one of the keystone examples of Pittsburgh's rebirth. Not that anyone remembers the earlier efforts to deal with the closing of Sears and open the Home Depot there. Maybe East Liberty's 'rebirth' came when they eliminated the pedestrian mall that once defined all that was inside the nominally kaput Penn Circle. But recall when Eastside (or is it East Side I now?) was but a vision. I am still waiting for the Krispy Kreme that was supposed to go in with the Whole Foods. That was just such a perfect Pittsburgh pairing... before the cupcake craze no less. Not to be of course, the anticipated chain of Krispy Kremes in town appeared to melt away. All of which is tied to more recent news of late. What was on the site of Eastside I and II before they were built? The central motor pool of that which is Yellow Cab in Pittsburgh. What is sad is that most of my memories are now the subject for the archeologists. A sure sign I am getting old. But I am really fascinated by the new moniker. What was one word for the longest time, Eastside, I take is now East Side. Semantics.. semantics. I wonder why the naming consultant thought that was necessary? There is more going on of note in East Liberty these days. The long off then on, then off, then on Hotel Indigo (first mentioned here in 2007) is showing signs of life with a whole new floor apparently being built on top of the Consad Building. But what is up with the uber earned media Ace Hotel that was to go in next to the library? 2015 is the buzz... and it may still beat the opening of Hotel Indigo for all I can tell. and as epilogue here: Michel Therrien was a fall guy! I don't think Alan will mind if I point out that he was born here in Pittsburgh while his father was employed here as the local uber data wonk of the day. He worked for the Bureau of Research of the Federation of Social Agencies of Pittsburgh and Allegheny County, an organization that was way way ahead of its time in the civic data world. Just another datapoint on how we lost our data edge, kind of like how the 'recipe' for concrete was 'lost' in the dark ages. Are you ready for your factoid of the day? Between 2007 and 2012, the number of acres harvested for agricultural crops in Allegheny County increased by over 10%, the biggest percentage jump across the MSA. That and more fun stats from recently released Census of Agriculture statistics. I personally wonder if the number of acres harvested in Allegheny County has ever increased in the past... in the 'modern' era that is. I bet we have been on a downward slope since... forever? And I'd be curious if anyone has specific insights into huge declines for Fayette and Westmoreland counties. Can you name the counties that form the Pittsburgh Combined Statistical Area (CSA)? I actually had this wrong until recently. Something that isn't anything new, in fact it is from a year ago, but0 I didn't notice revisions made to the definitions of local Core Based Statistical Areas (CBSAs). Some background first. A decade ago a lot of the definitions used to define metropolitan statistical areas changed. MSAs are defined primarily by commuting flows. If the population of an areas is large enough, and pairs, or groups, of counties have sufficiently high flows of commuters between them, they are considered to be integrated in one of various ways depending on how big the area is, and how big the commuting flows are. There used to be metropolitan statistical areas, typically collections of counties, or in New England collections of municipalities. If two or more metropolitan statistical areas were near each other, the collection of MSAs were called Combined Metropolitan Statistical areas (CMSAs). Then those definitions changed changed. First a new set of areas were created called micropolitan statistical areas were created. Places not big enough to really be considered metropolitan statistical areas, but still bigger than a lot of other smaller areas. CMSAs as previously defined went away, so if you catch anyone talking about the Pittsburgh CMSA, they are a couple decades out of touch. Now, really big metropolitan statistical areas can have subdivisions called metropolitan divisions, a bit analogous to what long ago were called Primary Metropolitan Statistical Areas (PMSA), also a term no longer in use. The collection of metropolitan AND micropolitan statistical areas are types of the more generic core based statistical areas (CBSAs). Now if adjacent CBSAs (metro or micro areas) are sufficiently integrated by commuting patterns they form a separate Combined Statistical Areas (CSA). Notice how you really ought not use the acronym MSA any longer, since it does not distinguish between metros and micros. In 2003, the Pittsburgh MSA was defined to be 7 counties (Allegheny, Armstrong, Beaver, Butler, Fayette, Washington and Westmoreland). Armstrong was new to the MSA just that year. There were 2 nearby micropolitan statistical areas: Indiana County formed one, and Lawrence County (the New Castle micropoltian area) formed the other. Indiana was kind of an independent CBSA without sufficient commuting into the Pittsburgh MSA to be linked to it within the CSA definition at the time. However, the New Castle micro (otherwise known as Lawrence County) did have sufficient commuting into Pittsburgh to be linked with it, so there was an 8 county CSA called the Pittsburgh-New Castle Combined Statistical Area. So last year, and I am embarrassed to say I did not catch this at the time, but the occasional redefinition of CBSAs had some major changes to the definitions of CBSAs regionally as of February 2013. Two big changes. 1) Indiana County is now integrated into the Pittsburgh CSA. Still not integrated into the MSA, but the CSA. A bigger change is that the Weirton-Steubenville Metropolitan Statistical Area became more formally linked to Pittsburgh. It remains a separate metro area, but the two counties ( Brook and Hancock counties in WV and Jefferson County in OH) are also linked to Pittsburgh in a much bigger CSA. So now there exists a 12 county Pittsburgh-New Castle-Weirton Combined Statistical Area. So with the most recent revisions, one definition of Pittsburg stretches into both Ohio and West Virginia for the first time. Only 20 more counties to go. But the machinations are less interesting than the bigger picture. In March the city of Pittsburgh submitted its biennial actuarial reports on the health of the city's pension systems. If you have trouble sleeping, those reports are on my pension information page for those who are looking for them. They are there on the right listed under 2013 reports for fire, police and nonuniformed employees respectively. (don't ask me why that page is not working well for chrome, works fine in IE and Firefox for me??). The new reports (from March) are there, but I'll get around to updating all the other graphs and tables on that page. Page 65 (per the PDF numbering): it looks like the value of the notional parking asset actually increased over the last two years. Given it was a fixed payment over a fixed period into the future, I'm wondering if the discount rate was lowered? But I still don't quite get how this will be valued dynamically into the future I have to admit. page 38: For those who disagree with me on just how notional the whole 'parking asset' is, note the extreme equivocation of the actuary: "The inclusion of the present value of this stream of dedicated future parking meter revenues does not imply that it necessarily qualifies as a pension plan asset under GAS 25 or for any other purpose" (emphasis added). Accounting standards are overrated anyways. and for anyone who thinks lowering the assumed future return of the (invested) pension assets is a bad idea, read the whole discussion starting on page 41 under the section Actuarially Recommended Amortization Payment. I won't try and summarize, just read the 5 paragraphs over and over again.